Thanks to @Plush Cat for the idea. Here is my 'me' collage. Here is my 'me' collage. INFP!!!!!!!!!!!!!!!!!!!!!!!!!!!!!! Oh geez, maybe I should do that hahaha. Most of the images are either pretty, "cute," or "magnificent." 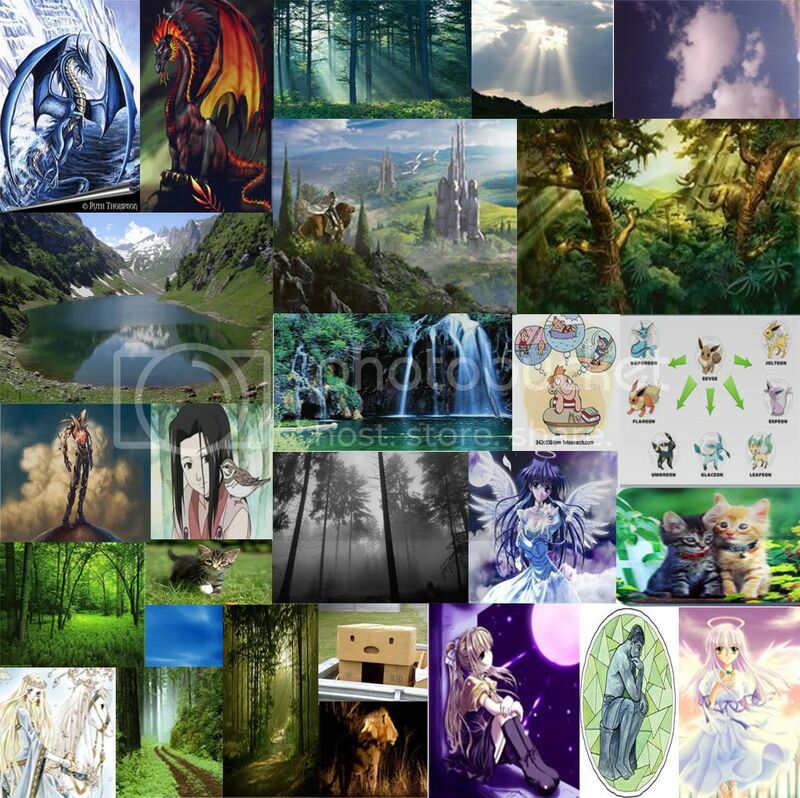 Angels, Skys, Forests, Eevee, kittens, and etc. Based on the collage I'm going to have to agree with INFP 9w1. I agree that the college seems 9-ish, with all the peaceful nature pictures and the cute stuff. On the other hand, if I did a collage mine would probably look pretty similar, so I guess typing by collage must be really hard. I think there might be quite a bit of a difference between the type stackings if @Savage Idealist is really a 9w1, because the images I generally gravitate towards is... intense in some way. And can you guys beleive that I still sometimes have doubts about being INFP? Hmmmm, 9w1 eh? I may actually take that into consideration once again. This looks like fun; I used to like to do things like this with pictures cut from magazines when I was a kid. Maybe I'll re-live my childhood days a little bit and make something to post here...maybe. Masquerading as a normal person day after day is exhausting. Yeah I used to like doing that too. I like this idea... maybe I will do one too. Your kisses, sweeter than honey. But guess what, so is my money. How would you type me as a child? By Kiddo in forum What's my Type? By Haphazard in forum What's my Type? By Tigerlily in forum What's my Type? First post- please help type me!